Aquariums are relaxing, rewarding, fun, really therapeutic and educational. However, finding the best betta fish tank for your space and needs can be difficult due to all the different kinds, sizes, and options available. This list covers the best fish tanks for sale while helping to educate fellow aquarists and enthusiasts to ensure they are successful, and your fish are healthy and happy. If you want to make sure your betta fish lives a long life full of happiness, joy, and stress free, you need to choose the best tank you can for your little friend. Three commonly known facts about bettas, also known as siamese fighting fish, are simple to learn and understand. 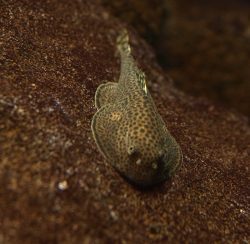 First, they are freshwater fish, specifically tropical fish which require a warmer environment. Second, they can survive in small tanks or fish bowls, though they do better in larger aquariums. Lastly, you shouldn’t keep two male bettas in the same tank as they are aggressive and will start fighting each other and will likely not stop until one or both are dead. Keeping that in mind, most people having multiple bettas prefer to use multiple small fish tanks that are usually under 5 gallons in capacity, typically around 2.5 gallons. 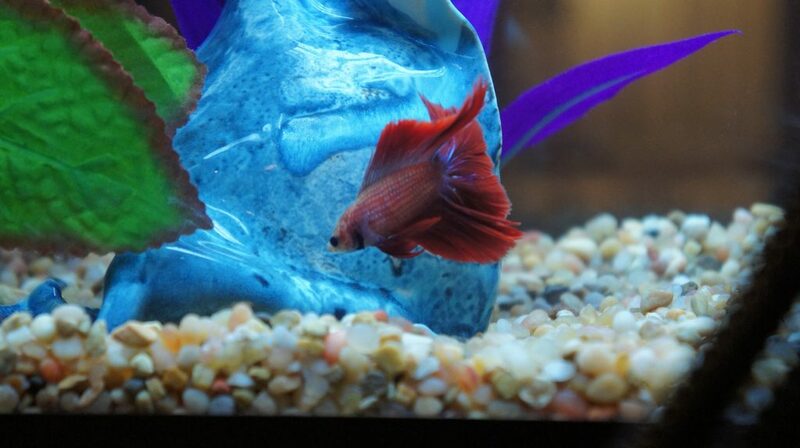 Because of their ability to tolerate poor living conditions, people mistakenly get the idea that bettas prefers small little tanks or bowls with no filtration or heating. Even worse, people stick them in plant vases, glassware, and other terrible enclosures. bettas should not be kept in tiny little tanks anymore than you or I ought to live in a closet. Just like any other tropical fish, bettas need space to thrive, and that means betta tanks must be well maintained and the right size for them to live and prosper. 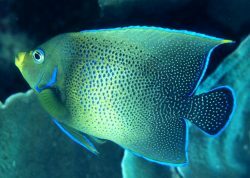 The shape of the tank that you choose is more of a factor that concerns you than it does your fish. Tastes and styles are different, but also you need to be smart with the free space in your home. There are traditional aquariums, round bowls, bow front tanks, tanks with dividers, Zen looking tanks with waterfalls, and the list goes on and on. 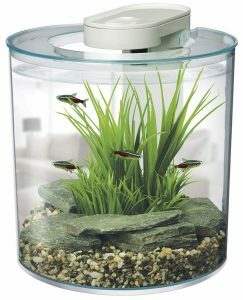 The truth of the matter is that the actual size of your betta fish tanks is more important than the types of a fish tank that you use. The general rule is the bigger the better especially if you plan to have multiple fish. Betta fish are typically sold in cups in pet stores which are fine for a short period of time, however, they do require adequate space to swim. They like to exercise and larger tanks allow them to do so. While they would love a huge aquarium, sometimes your space is limited so a smaller tank is perfectly fine. However, it’s not only better for their health and well being to have the space to swim around in, but larger tanks provide a better quality of water. Smaller tanks will need to be cleaned more often and will become soiled and filled with other contaminants if not. If you want your little friend to live comfortably and stress free, we recommend a minimum of 2.5 gallons. It is possible to keep bettas in smaller tanks or bowls, but they will require more cleaning and maintenance. Choosing a larger tank will ensure a healthier environment for your betta and his or her friends. You’ll spend less time fussing with the larger tank and performing water changes. You’ll have the far more room to decorate, meaning you can have live plants and fun decorations. Most tanks for sale at the size recommended will come with a filter already which means there is less for you to purchase. You will still need other aquarium supplies, some of which include gravel, an aquarium water heater, and betta food. If you are looking for betta food, our best Betta food guide is the place to start. While this guide is centered around aquariums for bettas, it is equally good for smaller tropical fish tanks, sometimes called freshwater fish tanks, or saltwater fish tanks. 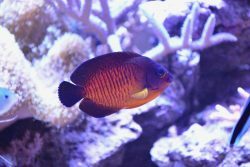 While the size might be limiting in the number of tropical fish or saltwater fish you can have, if space is an issue, these are still the best fish aquarium options. The tetra waterfall globe aquarium is a popular option for some owners, but we advise against it. It has two issues, the first being that it is too small for a betta, there is just not enough space. The second issue if the waterfall flow is too strong for a betta. 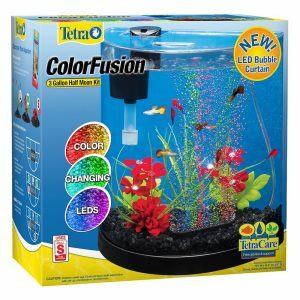 The tetra waterfall globe aquarium is better for a couple of small freshwater fish, like Glofish, and probably a shrimp or two.The choices outlined below are far better in our opinion for bettas. Below, you will find the best small betta fish tanks for sale. These are the top 6 choices, and you should be able to find one that fits both your style and space limitations. If you would like something bigger, see our 5 gallon fish tank buyers guide. With its beautiful and elegant design, this is truly an amazing and eye-catching glass aquarium. Not only is it beautiful, but it is also easy to clean and maintain with a simple tank cleaning regiment. 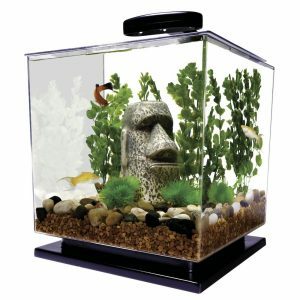 With its contemporary design, this fish tank will fit on any desk or counter in your house or at the office. Your fish friends will truly flourish in this tank and live happy, healthy and stress free. 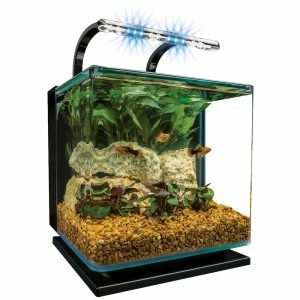 It offers a very efficient and quiet 3-stage filtration system and a built in 31 LED overhanging light structure that brightens the entire tank, from edge to edge. The LEDs have three modes; full light, blue for nighttime, and off. It will help to not only help to keep your precious betta fish alive, it will also help with any live plants or other critters, like snails and shrimp happy and in good health. This tank comes with almost everything needed to get setup, all you need to provide is the betta fish, aquarium heater, decorations, food, and any plants and other critters if you so choose. This is number one on this list for a reason. It’s exceptionally well crafted and a beautiful. However, the issue with this betta fish tank is the filter power. With many aquariums this might not be an issue, but betta fish tend to have a hard time dealing with the quiet but powerful filter. The betta fish tank filter is great, don’t get me wrong, but you need to make sure you address this issue prior to adding your beloved betta. We recommend adding an extra filter cartridge to the outflow valve to soften the filter flow and ensure your betta is in no danger and stays happy. Once addressed you can be worry and stress free, just like your beautiful betta. That small change makes this the best betta fish tank for sale and can also be used as a tropical aquarium or saltwater aquarium. This brand takes pride in producing quality products, and it is important to understand these freshwater starter aquariums offered by Tetra are great betta tanks. Elegant design is prominent here, and the raised base looks beautiful when water and gravel are added. Your fish will happily swim around in this high-quality tank, and that is why it is the second place on this list. The filter motor is not very loud at all, but it is a pump so inevitably it vibrates a bit. Our issue with this aquarium kit is the filter, it’s not very good. We recommend purchasing a better filter, with our recommendation being the Aqueon QuietFlow Internal Filter, when you purchase your aquarium kit. 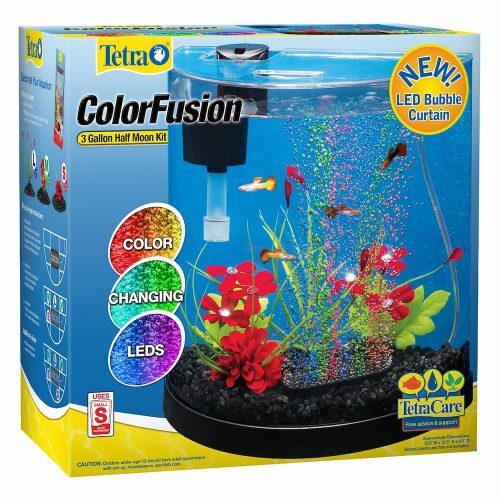 This tank does come with a light bar and helps to bring out the vibrant color of your fish. The size is great for a betta and some friends, maybe a mystery snail or two and some ghost shrimp. As with most betta fish tanks on this list, you will need to purchase a fish tank heater. This tank is plastic, unlike the Fluval Spec III which is glass, making is less expensive and possibly safer around kids and other larger pets. This tank is great for any desktop or counter and your betta and some friends will love it. 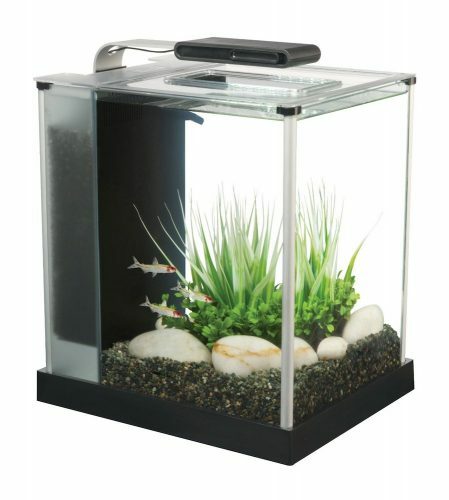 The Marina brand freshwater tank is very sleek, stylish, and almost silent. It looks good from all angles. It comes with a filter, LED lights, and even includes a bottle of water conditioner to get you up and running in no time. It’s a very pretty aquarium and looks great with the lights on as well. The lights could be brighter compared to some of the other betta fish tanks on this list, but that is the only downside to it. It’s beautiful and modern looking and is basically silent when the filter is running. All of the essential tank equipment is neatly enclosed in the white pillar in the back, which is very eye catching and professional looking. There is even a specific space designed just for a heater. We recommend the Fluval Marina Submersible Heater for Aquarium (https://www.amazon.com/dp/B00AFELT92/ref=psdc_2975456011_t3_B003TLWWOO). We also recommend turning the pump down to the lowest setting to ensure you betta doesn’t get too much current. This is a great product and we highly recommend it. This is a great looking tank! The LED lighting is not only better than average, it will illuminate the tank well during the day, and also includes a blue night light. Bright white and blue energy efficient LED lights feature a 3-way switch (toggle between white and blue, only blue for during the night, and off). The built in 3 stage filter and pump are quiet and work very well. They sit off to the side and completely out of the way, leaving you a lot of room to add gravel and any decorations you want. The flow of the pump is adjustable, and we suggest using the low setting. The white LEDs create a shimmering light in the water that mimics the underwater effect of sunlight, and the blue LEDs produce a relaxing moonlight glow. This kits feature a glass canopy which give you an easy to feed hole and can also be used for water mineral additions. The kits are beautifully designed, easy to assemble and setup, and even easier to maintain. The Marineland Contour Glass Aquarium Kit is a very good product and the fourth on our list of the best betta fish tanks. This tank also deserves to be on this list, however the price point is very high. EcoQubeC is an excellent entry-level aquarium. EcoQubeC Kickstarter had a successful campaign and now have the for sale for everyone. It provides almost everything needed to get set-up, and is easily maintained. There are even professionally-made videos for troubleshooting any issues you may encounter and a large FAQ section on their personal website. This tank tank holds 2.5 gallons which is the right size you need. This aquarium is beautiful and elegant. The filter and pump are quiet and setup is very easy. Within the package you will also receive a basil plant which will grow above the tank and also help with the water purification of the aquarium. Since the plant helps to clean the water like a filter, you never have to change the water and only need to top up every couple of weeks. This make it very low maintenance and a great decision for those people that would like some fish friends but don’t have time to do the needed maintenance other betta fish tanks on this list require. You also don’t have to strictly use basil if you prefer another plant more for cooking. Again, the biggest issue with this is the high sale price and you will still need to add a heater. This is a lovely tank with a good size at 3 gallons giving your fish and his tank buddies, like some shrimp and Mr. snail, a lot of space to swim around and enjoy. It is a very easy saltwater or freshwater tank to set up. The tank is a perfect half cylinder 180 degree shape that makes your betta easy to view from all angles. As with most of the aquariums on this list, it does come with a filter and built in pump, however you will need to purchase a tank heater. This aquarium kit also comes with a bubbler that changes colors and has an adjustable bubble flow control. The bubbler itself is an oxygen stone which means it adds oxygen to the tank, which is very good for the fish. The colors fun and eye catching which is great for kids. However, if you would like to have live plants, this colored bubbler is not the best option. You would be better off purchasing a LED light bar for above. 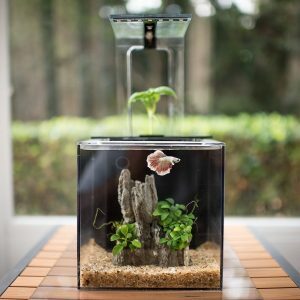 This is a good betta tank with lots of space, a good shape giving you a great view, and with a few minor upgrades can be a great option for any space and style. Another issue is the bubbler can sometimes start floating after a few months which probably means oxygen is getting into the unit somewhere. All the more reason to upgrade the lighting system and making it an even better tank. We hope that this list will provide you with enough information to make an informed decision on which of the listed betta fish tanks with filter, or siamese fighting fish tanks, is the best option for you. Taking into account the look, style, and space requirements, we feel that all of these tropical fish tanks offer exactly what is needed to keep your little fish friend happy, healthy, and stress free. That will help to ensure it lives a long life and provides you with enjoyment and serenity. As a quick reminder, it is important to remember that you should refrain from adding your new fish directly into their new fish tank without a temperature adjustment. If you do, it the sudden temperature change can cause shock. You should always help to acclimate your betta fish to their new environment and surroundings. When you purchase your Betta fish they will likely come in a bag with its own water that definitely has different conditioning agents to the water that you have set up in your fish tank. Instead, put the still closed bag on top of the water and let it float for about 30 minutes so the waters come to the same temperature, and then use a fish net to add your betta so you don’t add the store water. Ultimately, each of the tanks listed in our best betta fish tanks guide are easy to setup and maintain. Aquariums come in all shapes and sizes, and you have a lot of options. I hope that this betta fish tanks review will help you to find the right one for you. Let us know any comments or questions in the comment section below.